What caused the biggest jump since the Financial Crisis? 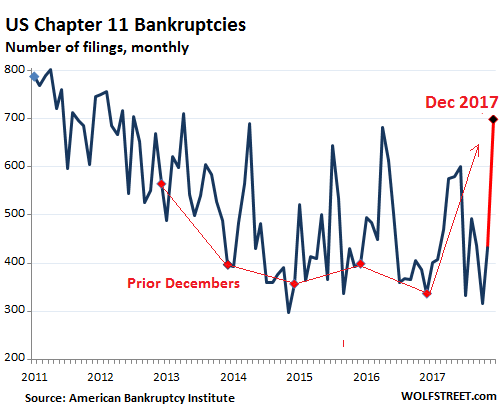 New Chapter 11 bankruptcies in the US more than doubled in December 2017 from a year ago to 699 filings. That jump of 362 filings from December 2016 was the largest year-over-year jump since the Financial Crisis. A spike like this in Chapter 11 filings in a month of December is unheard of in normal times. Normally, bankruptcies jump during tax season, the first four or five months of the year, but not at the end of the year. But these are not normal times. In December, Chapter 11 filings soared 61% from November. This is also highly unusual, as over the prior five years, presumably the “normal times,” the number of filings from November to December has fallen by an average 8.7%. In a Chapter 11 bankruptcy, a company attempts to restructure its debts under the supervision of a judge, and in the process often transfers part or all of the ownership of the company from pre-bankruptcy shareholders to creditors. In many cases, shareholders lose everything, and some creditors too lose everything. But in the end, the hope is that the company can “emerge” from bankruptcy with less debt and keep going, with a reasonable chance the make it. So what is causing this brutal spike in December bankruptcies? The Brick-and-Mortar retail Meltdown? We know brick-and-mortar retail is suffering, and bankruptcies have piled up in 2016 and 2017, and more will pile up in 2018, large and small, but they’ve been piling up all year, and the holiday shopping season is not the best time to go bankrupt for a retailer. It’s the best time to sell down inventory. The pile-up will happen in the first five months of the year, as it normally does. The Energy Bust? 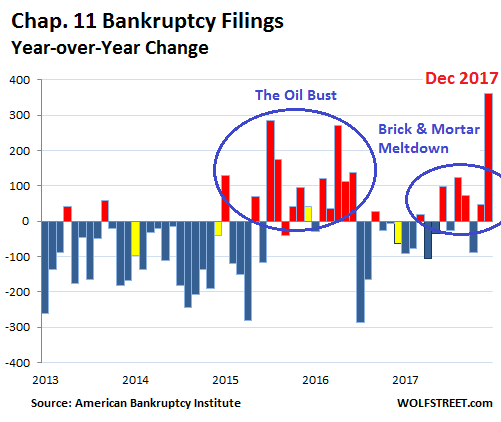 The energy-bankruptcy wave is largely behind us, as the chart above shows, where the era bristling with red columns was concentrated around mid-2015 to mid-2016. The horrendous spike in Chapter 11 filings in December had to have another cause. And it’s not that the economy is suddenly and totally collapsing, which it is not. But I think companies and their owners and creditors know one thing: They can write off losses in 2017 under the old corporate tax rates, at 35%, thus getting the government to pick up 35% of the tab of their losses via lower taxes. In 2018, the new tax law applies and all kinds of uncertainties have yet to be ironed out, and these companies – the owners and creditors – are thinking (I assume) that it’s better to try to recognize the loss in 2017, support it with a Chapter 11 filing, and pull the write-off into 2017 against a tax rate of 35%, rather than 21% in 2018. A tax-law change of this drastic nature motivates people jump through all kinds of hoops to save some money – including waiting in line for hours to pay property taxes early, a hitherto unthinkable strategy. And I think this is the likely suspect for the spike. Brick-and-mortar retail bankruptcies will continue to pile up and perhaps pick up the pace from last year, and it will brutal for shareholders and many creditors. Many retailers will not be able to restructure under Chapter 11 and will end up liquidating, and it will be messy. But it won’t look like a continuation of December. Total commercial bankruptcy filings – not just Chapter 11 but all types, including liquidation and for entities such as sole proprietorships – rose 2% year-over-year to 3,025, in line with recent trends, according to the ABI. But this spike of Chapter 11 filings in December looks to be a tax strategy. It better.